What a great stud dog he has been!. Bacchus is just the sweetest, most loving dog! He is bright, athletic, and a great guardian. He has that broad masculine classic head we all love and he throws it too! He is raising a new stud puppy for us this year, Crown Royal. We're happy to announce that Bacchus tested OFA certified normal for DM. OFA says that none of his offspring will have DM! He also got a terrific penn hip score, and has OFA normal elbows. Awesome, flawless temperament, handsome, and genetically sound; what a great guy! Please note: We do not sell ANY pups for breeding. All pups are sold for family pets only. Reserve your pup early! Most pups are reserved before they are born. Our stud dog Jamison has a flawless temperament, which he passes on to his pups. His hip score is 90%! His son ARGUS, is our OFA excellent stud dog. Jamison has produced a fabulous Search and Rescue dog, Surf. And one of his pups, Mr. Sunshine, is winning blues in AKC competitions! He is on the second leg of his open championship. 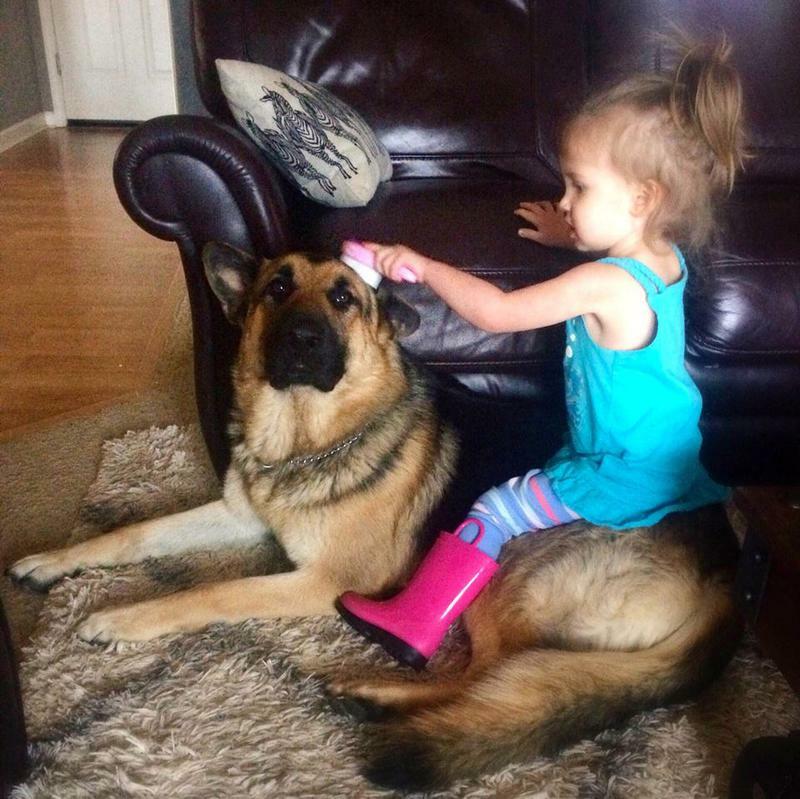 Our dogs do it all - family dogs, nose work, herding, service, therapy.... and they are naturally protective. 43 years of repeat clients tells the story. All pups are $3000. That price reflects 43 years of breeding healthy, sound-minded GSD. Our methods of raising pups are intensive and will provide you with one of the nicest pups you can find anywhere. Every one of the folks raising these litters is either a professional dog trainer or have trained with Michael Ellis. Your puppy will be extremely well socialized, exposed to a huge variety of toys, different learning experiences, strangers, neutral big dogs, cats and/or livestock, and young children. They are brave, loyal, love their humans, and very easy to train. They go on car rides, are started on harness, and spend time in crates. The best food, vaccines and parent testing means we give you the healthiest pups possible. Home raised with so much love. Lola is bred to Argus! Pups will go out end of May. Litter is all reserved. August. Deposit early for this litter - our list is already getting full. Expecting some plush coats! ​ Second summer litter: Zoi will be bred to our outstanding sire Argus. Fall pups: the last repeat litter out of Moonshine and Joshua.